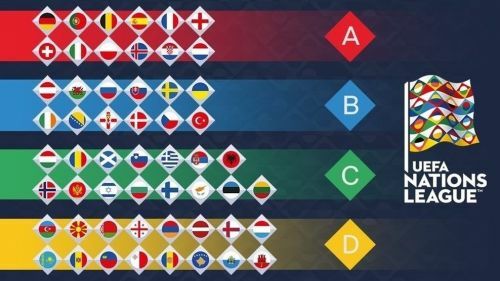 UEFA Nations League -Inspired or diabolical? UEFA has outdone itself. It has produced a concoction to cure all your headaches with a bigger one. The new Nations League would make perfect sense if you are willing to slog through a 400-page rulebook. There are further books on Intermediate and Advanced leagues to complete a voluminous and odious reading list. It is the newest toy for the International football community. UEFA Nations League is a competitive tournament that will be held every two years where European nations (55 for the inaugural event) will pit their best against each other. It will be in a league format and will provide a golden opportunity to compete in the Final Four showpiece extravaganza in 2019 (at least for the top 12 ranked teams anyway). 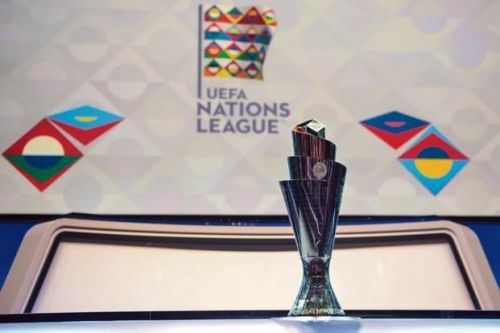 The winner will get their hands on a plush, glitzy Nations League trophy and a lavish kitty of £6.5 m. A whopping £67m prize trove has been demarcated for the inaugural Nations League. All the teams in League A will each get £1.3m each. Group winners will receive an additional £1.3m. The Nations League Champions will be given a winning sum of £3.9m to boot. Overall, the winners of League A can collect €7.5m; from League, B can get €2m; from League C €1.5m and from League D €1m of prize money. What it is certainly not is based upon the League of Nations, an intergovernmental political organization between 1920 and 1946. American president Woodrow Wilson even won a Nobel prize for its resounding (not!) success. Later, it helped Hitler’s propaganda in an indirect way. The botched experiment and precursor to the UN (it has not done much better). It will supposedly enhance the quality of international football by reducing the number of undesirable and worthless friendlies. The competition has been in the pipeline since 2011 and UEFA is hoping that this unique format will infuse a level of heightened excitement, intrigue and competitive streak to inter-country duels. Apart from the glory of being named National League Champions for the top teams, the format is touted as a blessing for the weaker teams. They will compete at an even keel, in a level playing field with teams of a similar level. Furthermore, they get better odds to qualify for European Championships with the bottom 16 ranked teams certain for at least one of the 24 qualifying spots. The Final Four tournament (groups winners in League A, explained below) will occur in odd years like 2019. This will ensure there is no clash with a World Cup or European Championships. There will still be room for international friendlies, particularly for the top teams, League A and B and the top group in League C. All of them have three teams in their group. UEFA Nations League has a total of 55 nations competing in four separate leagues (A, B, C, and D). They were arranged on the basis of their UEFA rankings (UEFA's coefficients) at the end of the 2018 World Cup Qualifiers for the first draw. Importantly, the composition of the draw for subsequent European Qualifiers will be based on UEFA Nations League rankings. The teams in each league will be divided into groups with either three or four teams in a group, depending on the league. Four teams, winners of each group will be promoted at the end of the cycle. Four teams, bottom in each group will be relegated in the same way. Promoted teams will compete in their new level in the next cycle starting in 2020. The four group winners of League A will play for the trophy of Nations League in for the Final Four competition next year. Where does it leave the traditional European Qualifiers? Euro qualifiers for 2020 European Championships will get underway next March in 2019. There will be dual fixtures in the months of March, June, September, October, and November. There will be 10 match days – which remains unchanged. The qualifying teams will be arrayed into five groups of five teams another five groups of six teams. The top two teams from the 10 groups qualify automatically for the Euros, while four more places at the finals will be awarded to play-off winners. Sixteen teams will compete in the playoffs. The UEFA Nations League will be entwined with the UEFA European Championship qualifying calendar. It will provide teams another chance to qualify for the European Championship. There will be four playoffs for qualification with each group winner entering the semi-finals. In case the group winner is already qualified (among the 20 nations which will qualify from the traditional qualifying route), their playoff spot will go to another team of the league based on rankings. The playoff spots for the league which has less than four unqualified teams go to teams of the adjacent lower league (to fill the four-team play-off mini-tournament). These teams will be those that have not qualified for their own League's playoffs. Thus, the best teams in the lower League will not be facing a harder and unfair competition from the remaining teams of the league above them. The 16 teams will fight in four groups of four teams, with the group winners earning a ticket to the Euros. They will play two semi-finals and a subsequent final to enter the Euro Championships as play-off winners. Thus, the four remaining qualifying spots for the European Championship (out of 24 total) will be decided. The format may well be used for UEFA's World Cup qualifications in the future (possibly restricted to the leagues A and B). There are some mouth-watering, finger-licking and lip-smacking matchups to look out for like England vs Spain, Portugal vs Italy, and Germany vs France (part 2 as the first match was a damp squib). UEFA has proclaimed that new tournament will lead to lesser strain on players with less travel and a leveled playing field. As a respite for the domestic clubs, players will also return relatively early to their club teams with the new International fixtures’ calendar. 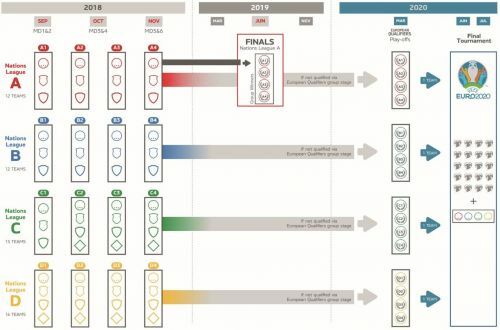 The Nations League and new Euros qualification process will be accorded in the current international calendar without any increased number of matches. However, UEFA has copped much flak for bringing in a slew of obfuscating and complex mathematical permutations to the beautiful game, especially for the impassioned fans. With an onslaught of games like Macedonia vs Gibraltar to come to your telly, not even the acutest of footballing intellect can truly explain the what, the why and the how of it. Only time can essay the right answer to that.